Big Bosses, Ratnapura Mines and First Look! It is a rare honor, even for GIA gemologists, to be invited to the homes of the sapphire mine owners or meet the most important figures in the industry. Without their gracious invitations, I would not have been able to see the mines or purchase some amazing sapphires, never before shown to the public. I am very grateful for my 30-year friendship with Aly Farook and his family, He has connected me with family businesses, miners, government officials, the big bosses, and the artisans who craft and cut raw conundrum into the beautiful Ceylon sapphires. 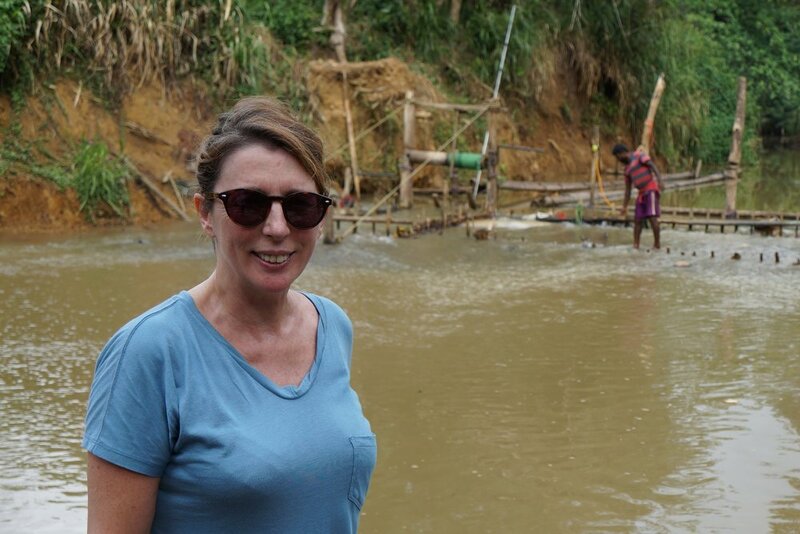 From the pristine cutting factory in Colombo, I headed out to the mines and waters of Ratnapura where miners have a keen eye and hard work to extract the rough sapphires from the earth. We traveled for hours on a steep switchback road up to the mountainous regions planted with Sri Lanka’s well-known tea leaves to arrive at the legendary city of sapphires, Ratnapura. We headed to a landmark mine that is deep in the natural landscape and can only be reached by those who have been in the trade for generations and who know the backroads. As with many ground pits I have visited all over the world, I see that the most basic and traditional mining methods are still practiced. Sometimes it is the lack of money, but here in Sri Lanka, it is because of Buddhism. They believe that animals’ lives should be spared, and big machinery would inevitably kill. Men use the same simple lever mechanism built of wood that was used a century ago to transport gravel bearing corundum manually up a deep mine shaft. Once collected at the top of the earth’s surface in sacks, the gravel is transported on a wheel barrow to a deep pit that is dug by the miners nearby. Then, the miners use their traditional method of washing this gravel for possible corundums – of which sapphires may be present - that is done by hand in a river. I had a chance to climb down the steep mine shaft. It was scary – there was no safety equipment to prevent a fall; I had just a rubber tube to hold onto as I tried to find any surface for stable footing. I went down far enough to see the entrance to a series of underground tunnels dimly lit by fuel lamps. We then continued deeper into the rural landscape to the shores of Denevaka River where I witnessed underwater mining for the very first time. Sri Lankans had discovered new sources of corundum – of which sapphires may be present - in a river’s historic alluvial deposits, often embedded deep in the riverbed. In order to excavate gemstones, a diver has to dive deep down a mine shaft to reach the bottom of the river. In that environment with little to no oxygen, the diver only has a simple rubber hose to breath from, a hose that is connected to a basic machine that pumps oxygen from ashore. Once brought up ashore, the gravel is washed in miner’s baskets. It is a technique done standing in the river, a gentle swirling movement that traps the corundum sapphire in their baskets, while the illam clay, gravel and sand filter through back into the river. This is what raw sapphires, straight from the earth, look like. From the rudimentary mines in which poor men toiled as long as it was light, we traveled to a different world of the titans who owned the mines. Living in grand mansions just beyond the mines, the sapphire owners keep a close eye on the mines and the valuable sapphires that are excavated. In addition to their own mines, the owners buy from individual miners who have their own ground pits on their small landholdings. Every day before dawn, small miners would come show the boss the previous day’s finds to sell for cash. For many years, it was the father who met them at the front door at 4 a.m., but as typical of family businesses, it is now his 20 year old son who rises early to deal with the miners. It is a very quiet lifestyle and the sapphire owners prefer their low profile. 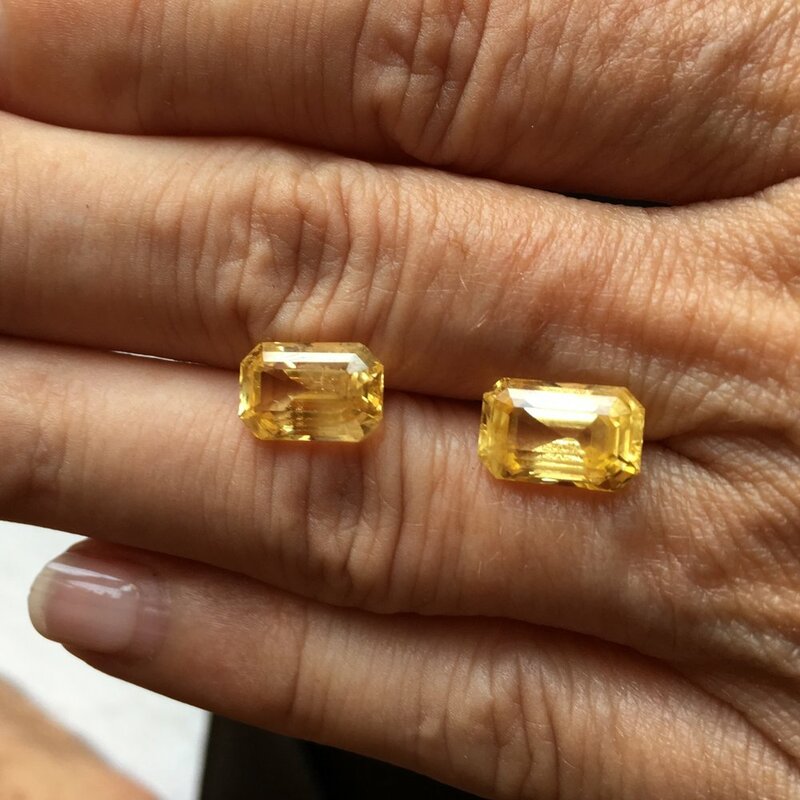 Through Aly’s connections, I was honored to receive the rare invitation to visit their home, and get an exclusive look at the very best and newest sapphires. In contrast to the grandeur of the mansion and the value of exquisite gemstones, we sat down around an ordinary kitchen table. Our tools were simply a scale and a strong flashlight. Unceremoniously, we were presented with small parcels of veritable treasure, an array of some of the rarest gemstones I have ever seen. From the classic Ceylon sapphires that are royal blue, to yellow and pink sapphires known as “fancy sapphires” which are scarce and out of the ordinary. I was fascinated by some unusually colored pink spinels. Of course, they were natural and unheated, but they were of such vibrant pink, as colored by traces of chromium. They were very valuable and the dealer was reluctant to let them go. The mine boss was also very proud to show us a 30 carat natural star sapphire. The star effect phenomenon or asterism is only exhibited if a light is shone on it, but otherwise stays hidden to the naked eye. Indeed, the finest six-ray star pattern appeared in the light, coming from the numerous tiny, needle-like inclusions in the sapphire.